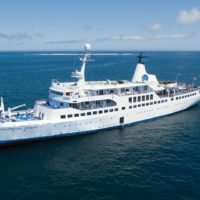 Itinerary includes Santa Cruz, Floreana, Española and San Cristobal Galapagos Islands. Start on Santa Cruz Island, viewing tortoises in the lush highlands before venturing down to world-famous Charles Darwin Research Station. Sail south to Floreana, disembarking at historic Post Office Bay and then Punta Cormorant. Head west to Punta Suarez on Española Island, whose rugged coastline harbours marine iguanas, sea lions, marine birds, and even albatrosses (at certain times of year). Gardner Bay provides beach-time and water activities, then on to San Cristobal’s Punta Pitt and Cerro Brujo, following the footsteps of young Charles Darwin on his 1835 visit. End at Puerto Baquerizo Moreno. Yacht Isabela II offers the perfect, intimate space for exploring Darwin’s islands in comfort. Traditionalists will enjoy feeling at home with a crew that has remained almost unchanged for years, leading to seamless attention to detail that will make your stay extra special. With just 20 guest cabins, the yacht’s convivial atmosphere leads to a close-up experience of this unique world. On board, guests find delicious cuisine, faultless service and excellent facilities, including a Hut Tub, fitness room, bar and outside deck for al fresco meals, and sunbathing. Scout the island sites for Big 15 wildlife in groups that average no more than 11-14 guests per naturalist guide which surpass the National Park standard, which permits up to 16 guests per guide. The ship offers a wide variety of aquatic activities including a glass bottom boat, free use of snorkelling equipment and kayaks, wet suit rental and the use of pangas for shore excursions. Get to see the Galapagos Waved albatrosses (Apr-Jan), Nazca, Blue & Red Footed Boobies, Frigatebirds, Galapagos Hawks, Marine Iguanas, Galapagos Sea Lion, Galapagos Giant Tortoises & Galapagos Penguin among other species. Visit Santa Cruz, Floreana, Champion Islet, Espanola & San Cristobal Islands. Dry landing: guests disembark of the dinghy onto the rocks or a dock. On arrival in Baltra, you will be picked up at the airport by our naturalist guides and board our bus to the highlands, where we’ll learn about Santa Cruz’s unique ecosystems and biodiversity. Lunch is served at a local restaurant. After driving down from the highlands, visit the Charles Darwin Research Station where the Giant Tortoise pens within an impressive Prickly-pear Cactus’ forest. These are the headquarters of scientific investigation, conservation and the National Park administration. Late afternoon, stroll along the main street of Puerto Ayora before embarking on Yacht Isabela II. Review the expeditions plan for next day, and enjoy the Captain’s welcome cocktail and dinner. After breakfast, you will land at Post Office Bay to visit the historic barrel that has served as an informal post office in the archipelago for over two centuries. Snorkelling off the beach. Your visit to Punta Cormorant takes in an olivine-crystal beach for an easy walk by a brackish water lagoon where bird species like stilts and American flamingos may be observed. On the other side of the island, you will see a white-sand beach where Sea Turtles come out at night to nest. Snorkelling will happen at lovely “Champion Islet” site. Alternatively, ride in the panga or glass-bottom boat. 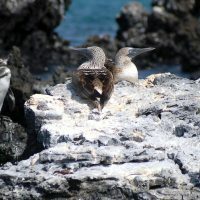 Your morning exploration at Punta Suarez provides an exciting walk on lava/boulder terrain to visit its unique Sea bird colonies, including the Galapagos Albatross (April – January), Boobies, Swallowtail gulls, Mockingbirds, and the famous “blowhole”. Also, look for red-green-black Marine Iguanas. Go back on board for lunch. In the afternoon, set at a beautiful, white coral beach where you can go for a short walk to observe Galapagos Sea Lions, Finches, maybe Hawks or just enjoy the beach. There are great snorkelling spots in this area. Otherwise do some kayaking or enjoy the glass-bottom boat. The turquoise colour of the waters at this location is a favourite for photograph lovers. In the morning, you will land on the eastern tip of the island. The trail that ascends from the beach provides spectacular views of the shoreline and is the only site in the Galapagos where the three species of Boobies can be found. There are also two Frigate bird species commonly founded in the island plus a significant colony of Bachelor Sea Lions. After the walk, if conditions are favourable, there will be an opportunity to swim, kayak or snorkel from the beach or to hop onto the panga for a ride along the coast. 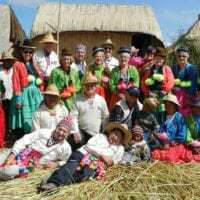 In the afternoon, following lunch on board, you depart on a panga ride along the shores of tuff-stone layers which take us to Cerro Brujo’s white beach. This is great for walking with great chance for a rewarding bird watching. Keep your eyes peeled for Galapagos Sea Lions. Bear in mind that these are the same shores that Charles Darwin walked on, back in September 1835. After breakfast, you will depart to the pier prior to San Cristobal’s Airport for your flight back to the mainland.